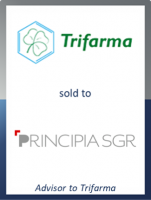 GCA Altium acted as exclusive financial advisor to the shareholders of Trifarma Group, an international manufacturer of active pharmaceutical ingredients (APIs), on the sale of a 70% stake to Principia SGR, a major Italian Investment Fund. Trifarma Group manufactures and supplies high quality active pharmaceutical ingredients (APIs) and advanced intermediates for the growing generic pharma industry. Trifarma is the undisputed market leader in both Clindamycin and Phenothiazine APIs. The Group also produces hormones and steroids. Trifarma has 4 manufacturing facilities in Italy and India, three of which are regularly inspected by US-FDA and other authorities such as AIFA (Italy), Anvisa (Brazil) and Cofepris (Mexico). This transaction marks GCA Altium's 9th successful deal in the healthcare space in the last year. Closing is expected towards the end of July, subject to customary conditions. Terms of the transaction were not disclosed.